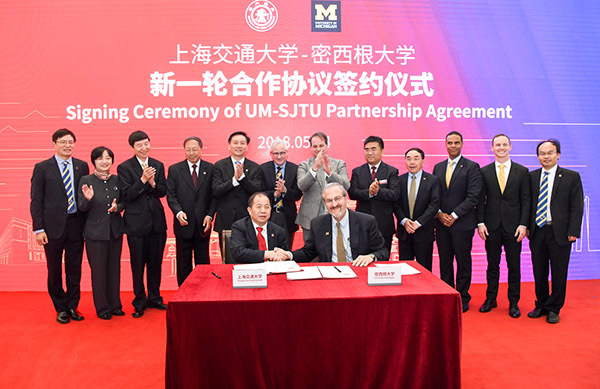 Shanghai Jiao Tong University (SJTU) and the University of Michigan (UM) signed another ten-year partnership agreement, vowing to expand bilateral cooperation and continue support of the UM-SJTU Joint Institute (UM-SJTU JI). 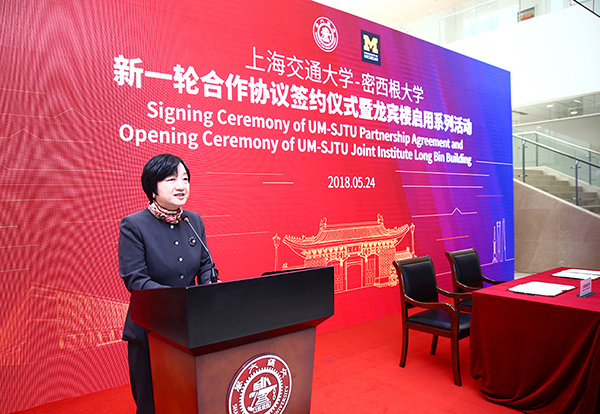 UM President Mark Schlissel and SJTU President Zhongqin Lin signed the agreement in a grand ceremony held at the newly-built JI Long Bin Building on May 24. According to the agreement, both sides will continue to propel the Joint Institute forward by setting up a Global Degree Pathway for its students, building joint research centers and enhancing faculty training and development. 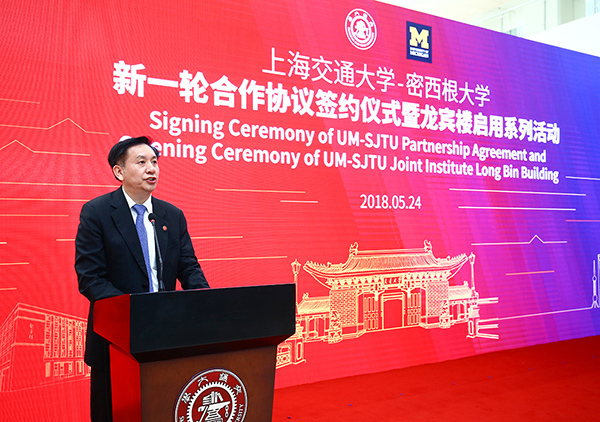 Sixian Jiang, Party Secretary of the SJTU and Chairman of the University Council, said the new round of partnership agreement is of landmark significance to both sides and will lay a solid foundation for the development of JI and bilateral cooperation between the two universities in the next ten years. The two universities will work together to deepen cooperation in the fields of international talent training, joint scientific research, and global development, on the course of promoting the common development of the mankind. “The Shanghai Jiao Tong University collaboration is UM’s largest and most comprehensive partnership in China. It has given hundreds of students from both our nations the opportunity to pursue excellent academic programs and conduct research. We have also fostered more than a decade of research interactions among faculty. 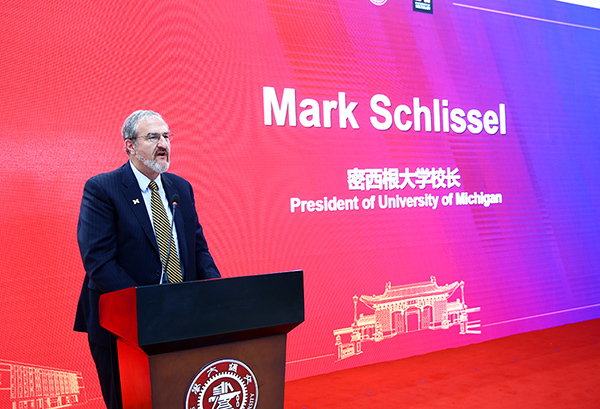 I am further excited by the possibilities as we extend and enhance our partnership,” said Mark Schlissel. Xuemin Xu, Vice President of the SJTU said that the agreement covered rich content including the two universities’ cooperation management mechanism, a new round of construction of the UM-SJTU Joint Institute, the cultivation of teachers and students. Both sides will further explore international cooperation, launch the Global Degree Pathway and faculty development programs, lead the new generation of global degree education reform, and establish more diversified international education platform. Meanwhile, the two universities will deepen bilateral research cooperation by shifting the mode of point-to-point collaboration to platform-to-platform and establishing a joint smart connected system research center. Leaders of the two universities witnessed the signing of UM-SJTU partnership agreement by their presidents. As a key element of the partnership agreement, the Global Degree Pathway (GDP) serves to lead the next generation of global degree-seeking education reform and build a more diversified international educational platform at JI. Building on the Joint Institute as a hub for international education, the GDP programs encourages JI students of the bachelor’s programs to pursue their master’s degrees at UM and other international institutions. “The GDP programs will open a `seamless connection` passage for students to pursue international education. There are two meanings for the `seamless connection`. First, the seamless connection of courses. Our ABET-accredited undergraduate programs puts the JI students on a par with the best universities in the world, enabling them to fit into education system of internally renowned universities quickly. The JI courses taken by students in China are well recognized by their overseas counterparts and need not be retaken during their graduate study. Secondly, seamless connection of first-class universities in the world. GDP will not only lead the students to pursue their graduate degrees at UM. We have also built up such passages with other top universities such as the Stony Brook University and the Swedish Royal Institute of Technology. Students can choose schools based on their research interests to achieve more diversified development,” said Gang Zheng, JI’s Associate Dean for Undergraduate Education. Undergraduate students at JI will be offered a number of GDP programs with UM and other global-leading institutions across a broad set of disciplines, including master’s programs in management with the UM Ross School of Business, GDP programs in integrated system design, mechanical engineering, ship and marine engineering, and electrical engineering with UM College of Engineering, GDP program in big data analysis and user experience research and design with UM School of Information, GDP program in environment and sustainable development with UM School of Environment and Sustainability, GDP program in applied statistics with UM College of Literature, Science and the Arts. “All JI students will have the opportunity to apply for the GDP programs. In terms of education mode and philosophy, GDP pays more attention to the cultivation of leadership, moral education and global vision. We are dedicated to fostering internationally competitive innovative leaders with global perspectives,” said David Hung, JI’s Associate Dean for Graduate Education. The partnership agreement also commits stronger bilateral cooperation in scientific research. Both sides plan to jointly establish a research center for smart connected systems to conduct high-impact interdisciplinary research in areas related to smart connected systems, such as smart sensing, wireless communication and networks, machine learning, and artificial intelligence (AI). The research results of the center are expected to advance IoT applications in smart transportation, smart health, smart city, smart vehicles, smart grid, etc. The center will strive to bridge fundamental research and engineering innovations, and also promote technology transfer and commercialization. “The management model of the Joint Research Center for Smart Connected Systems has been innovated so that scientists can concentrate on doing research. Our research will be guided by a combination of academic research and industry development, making best use of advantages of the two universities in multiple disciplines and institutes. At present, we have reached consensus with a number of leading industry players such as Bosch, Amazon and CIMC to carry out research on the purpose of solving actual problems of the industries. Top scientists in the two universities will lead young scientists to break the barriers between universities and enterprises and seek rapid development in the industries. The center will also provide more exchange and communication opportunities for graduate students to help them grow in a cross-cultural environment,” said Xinwan Li, JI’s Party Secretary and Associate Dean for Research. In order to improve the scientific research level and educational environment for both undergraduate and postgraduate students, the two universities agreed to strengthen faculty training and development. In the coming 10 years, teachers will be encouraged to attend more exchange activities and conduct joint researches, in a bid to achieve greater career development in teaching as well as scientific research.